Dave Weckl is well-known for his musical and technical mastery of the instrument. His clinics, Intensives, and video products have helped establish Dave as one of the most articulate teachers of his generation. 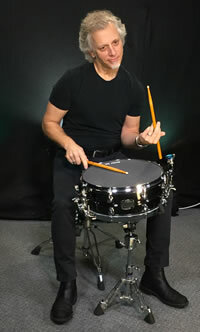 The Dave Weckl Online School offers a comprehensive and completely updated HD video curriculum for drummers of all levels. 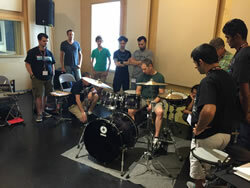 It includes lessons on hand and foot technique, ergonomic drum setup, tuning, guest instructors, play alongs, exclusive tour footage (with lessons from the hotel), and a private Facebook group so that you can interact with Dave, industry pros, and fellow members of the school! Drummers: click here to learn more and subscribe! Instructors: click here to learn about Dave's valuable affiliate program! Dave was one of the first major artists to offer play along products. They give drummers (and other musicians) the opportunity to practice to (and record their own versions of) Dave Weckl tunes. Singles You Can Purchase: Dave has a number of individual tunes that are part of play along packages. The packages, which sell for just $4.99, can be downloaded in Dave's store. They include the tune, a chart, and play along mixes (without your instrument). Click here to see them! Convergence: Dave's entire 2014 release, featuring a host of world-class musicians, is available in play along format for drums and all other instruments. Go here to see what is available! In Session: a play along package for Dave's popular Rhythm of the Soul CD. Designed for drums, keyboard, guitar, bass, and sax, only the drum and keyboard versions are available on Dave's site. Other instruments are out of print, but may be available on Amazon, eBay, and elsewhere. A Natural Evolution: "Exercises For Natural Playing," a video from this series of three videos from the 1990s, offers a play along track for "Tiempo de Festival" (Perpetual Motion CD). Ultimate Play Along Volume I and II: All-star musicians provide great music for you to practice and record to. Contemporary Drummer +1: Dave's original play along package with charts and play along mixes for many great song. Go here to see all the play along packages. Dave periodically runs one day "intensives" for a maximum of 12 participants. These classes usually happen on the second day of a planned clinic tour. Dave provides practice pad kits for each participant and works with the group on several areas of foundation. Keep an eye on the tour page for upcoming intensives. A few times a year, Dave will accept private students into his studio for one-on-one lessons. These are rarely planned in advance and are best for drummers in the Los Angeles area (so that Dave can schedule the lesson when time opens up). Write to questions@daveweckl.com if interested in a lesson. We cannot promise that the opportunity will arise, but Dave will hold on to your information if something opens up. Dave often joins the staff of Drum Fantasy Camp, an amazing educational experience that runs at Chicago's Vic's Drum Shop in early August. Other great instructors and a world-class band are on-hand for small classes, nightly jams, and two concerts.